The Champions league draw was announced today and Defending champions Real Madrid will face Bayern Munich in the semi-finals of the Champions League while Liverpool play AS Roma in a repeat of the 1984 final. Cristiano Ronaldo’s Real will travel to Bayern’s Allianz Arena for the first leg on April 25 as the Spanish giants go in search of a third successive European crown. This year the quarter finals have produced some of the most exciting football and dramatic finishes. Real, who have won the competition 12 times, reached the semi-finals by fighting off a remarkable Juventus comeback as Ronaldo scored a late penalty to earn a 4-3 win on aggregate. Bayern’s sporting director Hasan Salihamidzic said despite losing to Real in the 2017 quarter-finals, they held no fear for the Bavarians. Real director Emilio Butragueno said Zinedine Zidane’s team were confident they can win a third consecutive European crown. “It is truly historic to win two finals in a row and so obviously the prospect of reaching another final is an enormous source of motivation,” he said. Klopp said: “I tried to think about what I feel, but it was not that I thought ‘Thank God not Bayern, thank God not Real Madrid, yippee Roma’ or the other way around. Roma’s sporting director Monchi said: “This seems the perfect opportunity to achieve the happiness that we couldn’t get all those years ago. Liverpool will host Roma on Tuesday, 24 April and Bayern will host Madrid on the 25th. The second legs will be played in Madrid on May 1 and in Roma will host Liverpool the following day. 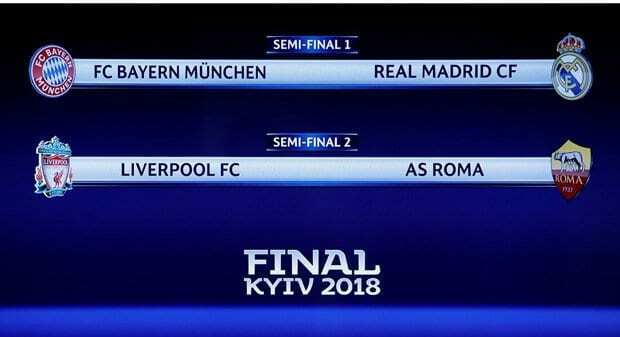 Kiev will host the final on May 26.